Below you fill find all funeral homes and cemeteries in or near Bay City. Popular neighborhoods in Bay City include: West Bay City. Suburbs of Bay City: Univ Ctr, University Ctr. Bay City is also known as: Bay County / Bay City city. Their current mayor is Mayor Richard Finn. Zip codes in the city: 48706, 48707, 48708, 48710. Some of the notable people born here have been: Rick Steiner (wrestler), Scott Steiner (wrestler), James A. Barcia (politician), Madonna (film producer and actor), Christopher Ciccone (interior designer and art director), Alex Izykowski (short track speed skater), and Betsy Brandt (actor). 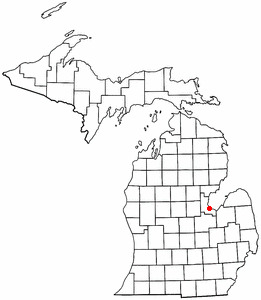 Bay City is a city in Bay County, Michigan, located near the base of the Saginaw Bay on Lake Huron. As of the 2010 census, the city's population was 34,932, and is the principal city of the Bay City Metropolitan Statistical Area, which is included in the Saginaw-Bay City-Saginaw Township North Combined Statistical Area. The city, along with nearby Midland and Saginaw, form the "Tri-Cities" region, which has more recently been called the "Great Lakes Bay" region.The city is geographically divided by the Saginaw River, and travel between the east and west sides of the city is made possible by four modern drawbridges; Liberty Bridge, Veterans Memorial Bridge, Independence Bridge, and Lafayette Avenue Bridge, which allow large ships to travel easily down the river. The city is served by MBS International Airport, located in nearby Freeland, and James Clements Municipal Airport. It was disclosed on October 31st, 2018 that Marian Curtis (Hurfilz) passed away in Clearwater, Florida. Ms. Curtis was 92 years old and was born in Bay City, MI. Send flowers to express your sorrow and honor Marian's life. It was disclosed on September 25th, 2018 that Mable "Joyce" Evans passed away in Bay City, Michigan. Evans was 88 years old. Send flowers to express your sympathy and honor Mable "Joyce"'s life. It was revealed on August 2nd, 2018 that Angela Lynn James (Castanier) died in San Diego, California. Ms. James was 72 years old and was born in Bay City, MI. Send flowers to express your sorrow and honor Angela Lynn's life. It was disclosed on March 25th, 2018 that Robert T Dr "Bob" Hartman passed away in Gaithersburg, Maryland. Hartman was 88 years old and was born in Bay City, MI. Send flowers to express your sympathy and honor Robert T Dr "Bob"'s life. It was revealed on December 20th, 2017 that John V Jr Pletzke passed away in Largo, Florida. Pletzke was 81 years old and was born in Bay City, MI. Send flowers to share your condolences and honor John V Jr's life. It was revealed by Lincoln Courier on December 18th, 2017 that James Walter "Jim" Skorzak passed away in Springfield, Illinois. Skorzak was 63 years old and was born in Bay City, MI. Send flowers to express your sorrow and honor James Walter "Jim"'s life. It was written on December 7th, 2017 that Robert M Wolf passed away in Bay City, Michigan. Wolf was 91 years old. Send flowers to express your sorrow and honor Robert M's life. It was reported on November 25th, 2017 that Nancy Lee Fullerton (Noyes) passed on in Frankfort, Indiana. Ms. Fullerton was 90 years old and was born in Bay City, MI. Send flowers to share your condolences and honor Nancy Lee's life. It was disclosed on November 12th, 2017 that Julia Abrahamowicz (Zalenski) passed away in Amherst, Ohio. Ms. Abrahamowicz was 100 years old and was born in Bay City, MI. Send flowers to share your condolences and honor Julia's life. It was revealed on November 8th, 2017 that Robert F Cole died in Safety Harbor, Florida. Cole was 79 years old and was born in Bay City, MI. Send flowers to share your condolences and honor Robert F's life. The early industrialists in the area used the Saginaw River as a convenient means to float lumber to the mills and factories and as a consequence amass large fortunes. By 1860, Lower Saginaw had become a bustling community of about 2,000 people with several mills and many small businesses in operation. During the latter half of the 19th century Bay City was the home of several now-closed industries including many sawmills and shipbuilders. The unified Bay City celebrated its centennial in 2005. Fitzhugh, Jr., a Bay City pioneer, and his wife, Jane, purchased land and built a home on property bounded by Washington, Saginaw, Ninth and Tenth Streets, which later became the location for City Hall. The official website for the city of Bay City is https://www.baycitymi.org/. Read Full Blog Post (27) Oct. 25, 2010 | Concerned about the financial impact the year-end expiration of the Bush tax cuts would have on stockholders, the parent company of Tri City National Bank ... a dentist from Whitefish Bay. That's right, a dentist! Bert was born on Sept. 20, 1925, in Bay City, the daughter ... Traverse City, MI 49684. Please sign her online guestbook at www.mortensenfuneralhomes.com . The family is being served by the Mancelona Chapel of Mortensen Funeral Homes. Aldwyn Barden, 95, of Boyne City, passed away Monday ... Hospice of Little Traverse Bay, or Northern Michigan Regional Hospital. Friends and family wishing to share a thought or memory are encouraged to do so online at www.stonefuneralhomeinc.com. Listing all funeral homes in Bay City, Michigan so you can easily send flowers to any location (same day delivery) or find any funeral service. We work with local florists and flower shops to offer same day delivery. You will find budget sympathy flowers in Bay City here. Our funeral flowers are cheap in price but not in value.